we show especially in promotional umbrellas. From our warehouse in Regensburg we deliver in short term a wide range of umbrellas. Benefit from our decades of experience on advertising umbrellas - we have produced the best models for you and put in stock. We supply the unprinted umbrellas to you or directly to your printer, but also offer the possibility of your print job with our experienced printer in Bavaria. 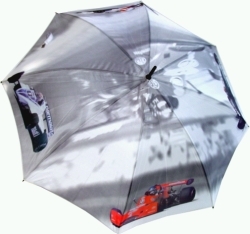 For larger quantities of umbrellas or advertising umbrellas manufacturing is worth in Asia. Your advantage is in addition to price, the free configurability of the umbrella in material selection, handle shape, packaging, etc., as even the umbrella frame and the fabric can be made individually for you. In addition to our stock items, you can create your own umbrella (White-Label) or choose from our additional program.